Note from The Great Morel: This is essay which was submitted to The Great Morel from Racheal in Idaho. She does a fantastic job in portraying the various aspects of what morel hunting encompasses. Hidden in her work is the ever occurring theme of family. Mushroom hunting is a season here in Idaho. When Spring comes and the weather starts to change, people begin talking about the mushrooms. People are more than happy to talk about their catch, but hardly ever will you get anyone to tell you exactly where they go. We keep our spots secret, so the next year we might have a better chance of coming out of the woods with a heavy bag of wild mushrooms. We have always went mushroom hunting as a family. My mom, my sister, my grandma, my grandpa and I have went almost every year. I think I have been going since I could walk. Some years we add more people into the bunch. I love to take someone who has never gone before. They get so excited if they happen to be the first to find a mushroom. Supplies you will need: As we prepare to go mushroom hunting we must think ahead. Some tools are very essential for mushroom hunting. First, a knife is needed. It just has to be a small pocket knife or a paring knife from the kitchen. You also need to have a bag for carrying them throughout the woods and also have some flat boxes that can be laid in the trunk. It’s good to spread them out because the weight of the mushrooms causes them to crumble. If you are unfamiliar with the area, you should go with a map or compass just in case you happen to get lost- as it is an easy thing to do since you are walking through the woods for hours looking at your feet. A few years back, my sister-in-law and I went out mushroom hunting alone. We went to a place that was familiar but somehow we got turned around and ended up on another road. We had no cell service and we ended up walking for about an hour before we finally found our car. It was a very scary experience. Usually it’s still a little cold. So we try to have several layers of clothing just in case. It’s important to wear long pants and sneakers, just in case it is warm enough for the snakes to be out. We also wear our hair up, sometimes with a hat because some years we have seen ticks. We always make sure to bring an extra coat in the car, in case it does get cold. We also pack a lunch and make sure we have extra things to drink. You never know when your car will break down, or you might get stranded. It’s always better to be prepared. Weather: The weather is the most important determinant of when to go mushroom hunting. Most of the mushrooms emerge as the snow starts to melt (Freedman). People have all kinds of their own ways to determine when they should be heading to the woods looking for mushrooms. Ideally you should wait until in the spring when the temperature rises during the day to the sixties, and no colder than the forties at nigh- time (Stewart). Most people who I know wait until we have had some rain and then a few really warm days. We always go to Waha, which is about thirty to forty five minutes away from where we live. It is UP in the mountains, and my grandpa used to tell us that to find out how high up to go, you look for the skunk cabbage. Skunk cabbage is a green sort of foliage that erupts through the ground at the beginning of spring. If you break a piece off, it really does smell like a skunk. As you travel up the Waha grade, it starts out small, sometimes barely poking through the ground. As the elevation gets higher, the skunk cabbage gets larger. The wild mushrooms like to grow in the same sort of environments as the skunk cabbage does. Environment: Wild mushrooms usually like moist areas, around burnt areas, and around fallen trees (The Great Morel). We have also always had more luck in the shady areas, such as under larger trees. Also areas, that are not as accessible to wild animals, like right around stumps of trees or in smaller areas that deer may not be able to get to. So it requires a lot of looking underneath brush and leaves. Just because you find them in one area one year doesn’t mean you will find them in the same spot the next year. They like to move from one area to another (Freedman). When picking the mushroom, we use a small knife and cut as close to the ground as possible without digging it up. This means it can grow back later. You are not harming it, it’s just like picking fruit off of a bush (Kuznik). We have a family place that we like to check out every year. You walk for quite a while before you come into this dusky clearing. It’s pretty shaded from the trees and it is off the path. The mushrooms are almost always thick there. You can stand in one place and pick a whole bag. Different kinds of mushrooms: There are several types of mushrooms to look for. In our area, we mostly pick Morels, Brains, and Elephant Ears. Elephant ears are very hard to find. They are a medium brown color and are flat to the ground. They are very fragile so we usually don’t end up with any of them. They are still fun to find though. Brains are also less common and very crumbly. They do look like brains, and are usually a medium brown color. 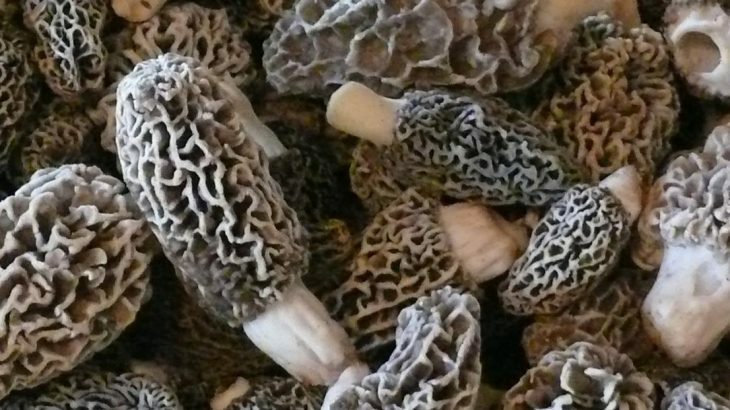 Morels are the most common, and best tasting ones that we usually hunt for. They are firmer and still have the appearance of a brain. But usually they are longer, anywhere from one inch to four or five inches tall. They have a cream colored stem, and the top color ranges anywhere from brown to orange to black. Stay away from mushrooms that are mushy or wormy (Freedman). Wild mushrooms have a smell that is kind of hard to describe. They smell a lot like mushrooms in the store. They have a very earthy smell. Cleaning wild mushrooms: After you pick your wild mushrooms and return home it is very important to clean them properly. Mushrooms cannot be washed like other vegetables as they are very fragile. Some sources say that you should slice them down the middle and rinse them (Freedman). Our family always gets them home and cleans them up as best as possible. Then we place them in large tubs of salt water and keep them in the refrigerator over night. We do this because there is not only a lot of debris that come off of the mushrooms but there are also a lot of tiny bugs. If they are really dirty we change the water in between. I personally would not avoid the soaking process. It does not take away any of the flavor. Some people think that mushrooms absorb the water if soaked, but from our experience they have never been soggy or mushy from one or even two soakings. Cooking wild mushrooms: Our family have a certain way that we eat our wild mushrooms. I found a recipe online that is just like the way that we eat our mushrooms. We like to slice them in half or even quarters. Then we dredge them in flour, salt, and pepper and fry them in butter until they are very well browned and a bit crunchy (Chef Sara). Then take them out of the butter and let them sit on paper towel. Morels have a nutty meaty taste to them. When you cook them until they are crunchy they are a bit salty. We love them. They are a little rich, so it is good that you can only get them once a year. One year we had some missionaries from church over to try our mushrooms. They both had lived in areas where they did not hunt for mushrooms and they were very excited to try them. There are many other ways to eat wild mushrooms. My grandma likes to add them to spaghetti sauce and casseroles. People like to try other recipes such as Morels in wine sauce, Morel mushroom soup, Mushroom gravy, and Morels and wild rice (Pendleton). People also like to cook with dried morels. They say that the flavor is still very good and you just have to add some liquid to plump them back up before you add them to your sauce (Freedman). Being together as a family: We really enjoy going mushroom hunting every year. It a great family activity. There is no TV or phone to distract anyone. It’s nice and quiet and gives a family a great chance to reconnect with each other. Mushroom hunting can be very physically demanding depending on where you hunt, there is a lot of walking involved. If you are unfamiliar with the area, precautions should be taken to avoid getting lost. My grandpa is missing from our hunting party now. I am pretty sure if there was one thing he misses it would be the mushroom hunting. We spent so many spring days walking through the forests of Idaho. My grandpa always used those days as teaching for something else. Those days were always spent learning many things, I even learned how to drive a truck while we were mushroom hunting. We look forward every spring to loading up the car with our cooler and warm clothes. So many of my childhood memories wrapped up in this activity, and so many family members are involved. We had so much fun trying to see who could find the first one. We used to race to see who could find the most, and sometimes it got pretty wild if two people spotted one at the same time. So, for now we sit back and wait. As soon as grandma gives the word that the skunk cabbage is up, we will start getting ready for our next hunt. Worthy of Reading essay. permalink.